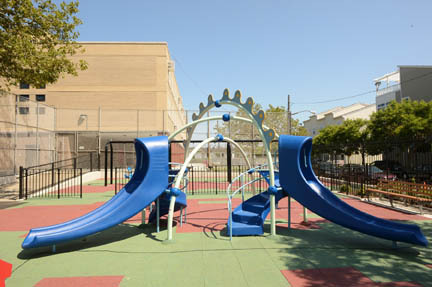 Beach Channel Playground provides recreational facilities to local residents of Rockaway, Queens. 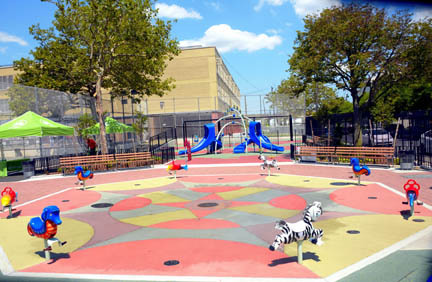 The playground name comes from nearby Beach Channel Drive. The name Rockaway was probably derived from the Delaware or Chippewa words for “sandy place.” The peninsula became known as Rockaway after it was colonized by Europeans during the 17th century. The original Canarsie Native American inhabitants sold the mostly barren land to Captain Palmer, an Englishman, with a deed granted by Governor Thomas Dongan in 1685. Disappointed with his purchase, Palmer sold the land in 1687 to a prominent iron master from Long Island, Richard Cornell, whose descendant Ezra founded Cornell University in 1865. The Cornell family owned the land until 1808, when a partition suit divided the plot into 46 parcels that were eventually sold to outsiders. The Rockaway Association, a group of wealthy New Yorkers, bought much of the property and began to build exclusive resorts in 1833. Within two years, James Remsen bought a large portion of the Peninsula. Remsen initiated a railroad project connecting the neighborhoods of Canarsie and East New York. The new railway was intended to greet steam ferries taking passengers to and from Rockaway. The Rockaway Peninsula remained a beachfront resort town, providing hotels, restaurants, and housing for summer visitors. During the 1890s, a variety of amusement parks were built. In 1898, the Village of Rockaway Park was incorporated into New York City. Improvements in transportation, under the direction of Parks Commissioner Robert Moses (1888-1981) in the 1930s, led to the growth of Rockaway. The completion of two bridges, the Marine Parkway Bridge in 1937 and the Cross Bay Bridge in 1939, connected Rockaway to mainland Queens and Brooklyn. Innovations in railroad service and the development of the elevated subway allowed popular access to the peninsula. Subway access stimulated Rockaway’s transition from a vacation area to a neighborhood with permanent residents. 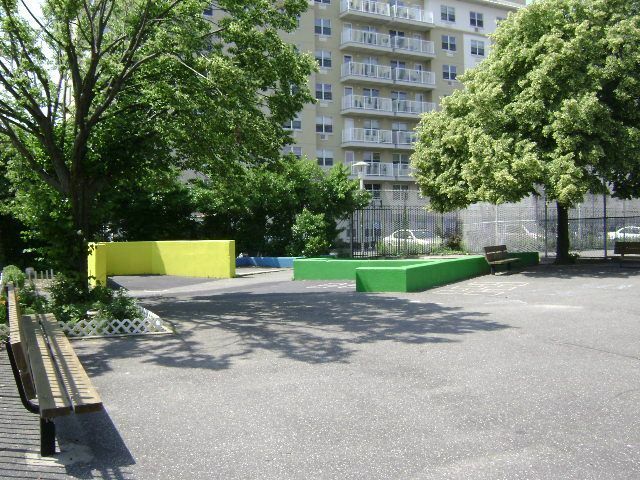 The City acquired this land, located between Hammels Boulevard, Beach 80th Street, Beach 79th Street, and Beach Channel Drive in October 1958, and the playground is now jointly operated by Parks and the Board of Education. It contains one full basketball court, two basketball half-courts, a sandpit, two handball courts, a large softball field, and benches. In 1997 $105,216 allocated by Mayor Giuliani funded the reconstruction of the sidewalks, paths, and pavements.